The Nobu brand is a globally recognisable name, conjuring up images of sophisticated sushi and celebrity endorsements – starting with it’s co-owner, Robert de Niro. Behind all the glitz and glamour, the restaurants, the hotels and sake lines, lies a fascinating story of triumph over adversity. I’m almost surprised they haven’t made a movie of Chef Nobu’s life yet, but then this blockbuster script is still very much one in progress. 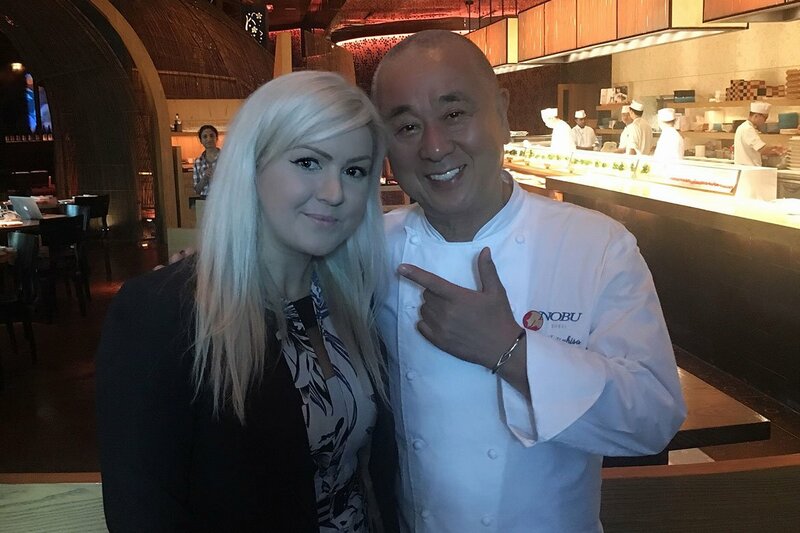 Being one of 32 outposts of the ‘Nobu’ empire (not counting the 8 Matsuhisa restaurants), Dubai is lucky enough to have the man himself visit on occasion – and on this trip I was lucky enough to sit down with the legend for a quick chat. 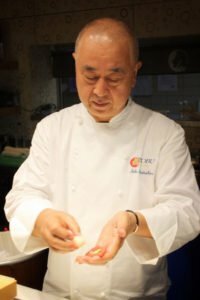 And I mean quick – when you see how much work Nobu crams into his visits, it’s little wonder this superstar chef has managed to completely change his fortunes, going from a burnt down restaurant to forming one of the world’s biggest culinary empires. 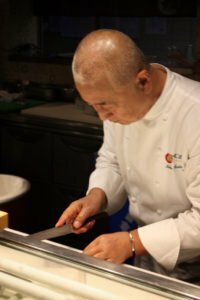 Nobu’s epic culinary tale begins with falling in love with the art of sushi following the tragic passing of his father at age 7, a profession into which he headed after graduating high school. It’s a career choice that will take him to Peru at 24 years of age, where he would develop his signature Peruvian/Japanese fusion cuisine, creating such dishes as the (oft-copied in Dubai) ‘Black Cod in Miso’. Following a fateful fire that swiftly destroyed his next venture in Alaska, Nobu took his unique style of cooking to Los Angeles, opening his first restaurant in the City of Angels fourteen years later. Robert de Niro asked you to open a restaurant in New York with him, but you said no the first time around – it took you some time to say yes. How did he convince you? He asked me to open a restaurant in New York City, and for me it was too early. My first restaurant opened 1987 and he asked me the year after. So it means my new restaurant was not organized yet. So, then he showed me the New York locations, he invited me to New York, I stayed 3-4 days with him, he explained all the dreams…but you know, I said, ‘Bob, thank you so much, but it’s still too early.’ That’s why I said no first. He said, ‘Oh, ok, I understand’, but after this, he still came to LA often, always stopped by my restaurant – ‘How are you doing, hows it’s going?’. Also, media started talking about my first restaurant. A year, two years, three years, four years after, he called me again, and said, ‘Hey Nobu, maybe you should come back to New York again’. I was so surprised, because he was waiting for me four years. That’s why (I said yes). It’s not only being a hollywood star, it’s because I trust him because he was watching me, I appreciate he asked me again. That’s why ok, (I decided) maybe it’s time to go to New York. I opened the first Nobu New York in 1994, 22 years ago. How does the design of the restaurant integrate with the food? We work with a designer, David Rockwell. He has a lot of big projects, you know, he knows our style. We design the kitchens, but he makes (interior) designs like this (Nobu Dubai) – inside like a big wave, inside like bubbles, inside like water, inside like oceans. Like fashion, every new restaurant is his taste, the new style that is coming. How do you stay healthy and on the ball when you have to travel so much of the year? I travel ten months a year – it’s not only time difference, you know. Now it’s summer here – Japan is winter, in New York it is very cold. I’m always travelling, dealing with changes in time, changes in cultures. It’s sometimes confusing as to where I am. Vogue has called Nobu the world’s hippest restaurant chain. What do you think attracted so many celebrities to the Nobu brand around the world? Maybe they trust our quality, our product. Also they come to feel comfortable. In Dubai, it’s not always easy to get some of the ingredients you would need here. How do you ensure that quality remains the same across restaurants in different countries? I remember the first time I came to Dubai, it was more than 15 years ago. I went to some hotels where Japanese chefs were working, told them we were planning to come to Dubai, and they taught me how to get the produce. Back then, in the summer time, you would open the faucet, it’s supposed to be cold water, but hot water is coming out. How am I supposed to prepare fresh fish with hot water? Impossible. Now all the hotels in the restaurant have chilled water for the kitchens coming straight out of the faucets. We have the same produce company all over the world, it’s called JFC, they know everything I use so after we opened this restaurant, their company opened in Dubai too. They follow us. So now when we open a new restaurant, it’s much, much easier than before to get the same product. What are your favourite dishes at Nobu Dubai? My favourite? I love sushi…I love sushi. He eats almost anything, except he doesn’t like much shellfish, especially oysters. But he has good taste – he travels all over the world, eating at all the best restaurants. He is a very good judge for us. What’s the secret to Nobu sushi? Technique is very important. For good sushi the fish has to be very good quality, very good quality rice, and the technique – it must be made with passion. How do you pass that passion on to your chefs around the world and maintain your high standards? Of course, each person’s passion is different. But I explain to the young chefs, don’t just automatically make sushi. Always stay customer-side. Being a chef is not about ego, they have to always be about working for the customer. The balance, speed, portions, they must be always communicating. All the details must be there, because we are professional chefs, not amateurs. The professionals have to see more detail. Are lists like The World’s 50 Best Restaurants, Michelin, etc. important to you? I’m not against Michelin, but myself, I’m not looking for Michelin stars. I don’t want or need the title. My point is customers come, I stay here (in the restaurant), I look at the tables and see how they are eating. My best view is if customers are sitting down, laughing, smiling – this moment that I see is better than a Michelin star. Customers come here not to spend money – they come to enjoy food, enjoy time and enjoy spending it with friends. In our space, I like to see customers come, see them smiling and laughing. This is my Michelin star. I have been designing my own plates for more than 10 years, but this last year Anita porcelain is 400 years old – so to celebrate, this year I have created a special design. I like to use all of the plates I have designed in my restaurants. My design, my Anita plates, are beautiful, and have more than 100 years history. My designs show no fingerprints. It it a lot of fun working on these projects? Yes, I love it. The plate is like the canvas. Every chef has a different sense, they put the colour on the canvas. Which chefs around the world inspire you? Well I know a lot of chefs, especially last year I made a five episode series for Discovery Asia, so I invited five chefs to Japan. We travelled together, cooked together – Jean-Georges, Thomas Keller, Eric Ripert, Jose Andres and Daniel Boulud. So these five top chefs, these are my favourite chefs. What about knives? What’s your favourite knife? I don’t have a special brand I choose. Knives have to be hard steel, not too soft. Your sashimi knife needs to be a very sharp knife – at the end of each day, you have to sharpen it, every night. 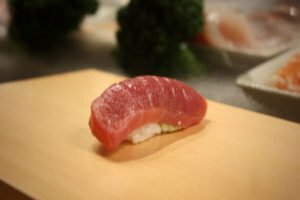 One tip for people making sushi at home? When I asked if there would ever be a Nobu in New Zealand, I’m told that although there are no plans at the moment, he is a fan of Milford Sound, calling it ‘beautiful’. But Auckland, on the other hand, is memorable to Nobu because of, I’m sorry kiwis, sheep. He recounts a story of playing golf in Auckland on a windy day, the ball being blown off course into a neighbouring flock. I’m told the ‘sheep was OK’, but if we ever see a New Zealand outpost of Nobu I’m have a feeling you might see lamb feature heavily on the menu!